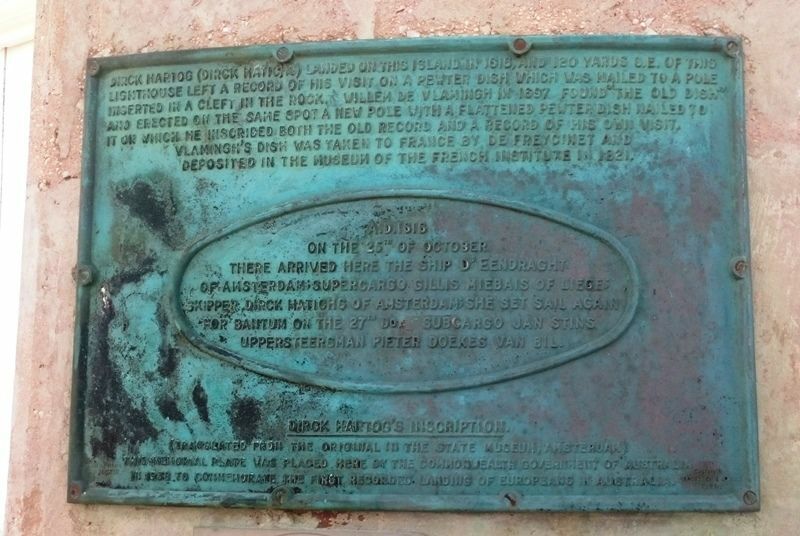 A plaque incorrectly commemorates the first recorded landing of Europeans in Australia. On the 25th of October 1616, Captain Dirk Hartog arrived on the 'Eendracht' and announced his arrival by leaving an inscribed plate with his name and date of arrival at Cape Inscription. The plaque states it commemorates the first landing, but the first documented and undisputed European sighting and landing on Australia was in late February or early March 1606, by the Dutch navigator Willem Janszoon on the Duyfken. He followed the coast of New Guinea, missed the Torres Strait and explored and charted part of the western side of Cape York, in the Gulf of Carpentaria, believing the land was still part of New Guinea. On 26 February 1606, Janszoon made landfall near the Queensland town of Weipa. The Prime Minister (Mr. Lyons) announced today that the Commonwealth Government has decided to provide an amount up to a maximum of £50 for the erection of a tablet on Dirk Hartog Island, Western Australia, to commemorate the visit of Dirk Hartog in 1616, which is the first recorded landing of Europeans in Australia. The Government of Western Australia and the West Australian Historical Society some time ago invited attention to the conditions of certain posts which had been erected by the Government of Western Australia in 1907 in replacement of other posts which had historical associations dating back to Dirk Hartog's visit. An investigation was made by the Commonwealth Director of Navigation (Captain J. K. Davis) during the visit of the Commonwealth lighthouse steamer Cape Otway to the Island last year, and following upon his report the Commonwealth Government has decided to provide a suitable commemorative tablet, which will be affixed to the Commonwealth lighthouse tower on the Island. The terms of the inscription to be placed on the tablet will be discussed with the West Australian Historical Society. The draft, which is being submitted to the society, provides for the inclusion of an English translation of the record of the inscription left by Dirk Hartog himself on a pewter dish, which has been preserved and is now in the museum at Amsterdam. The West Australian (Perth), 6th April 1938. Dirck Hartog (Dirck Hatichs) landed on this island in 1616, and 120 yards S. E. of this lighthouse left a record of his visit in a pewter dish which was nailed to a pole inserted in a cleft in the rock. Willem de Vlamingh in 1697 found "the old dish" and erected on the same spot a new pole with a flattened peweter dish nailed to it on which he inscribed both the old record and a record of his own visit. Vlamingh`s dish was taken to France by De Freycinet and deposited in the Museum of the French Institute in 1821. On the 25th of October there arrived here ths ship D`Eendraght of Amsterdam ; Supercargo Gillis Miebais of Lieges, skipper Dirck Hatichs of Amsterdam ; She set sail again for Bantum on the 27th Do Subcargo Jan Stins Uppersteersman Pieter Doekes van Bil. This memorial plate was placed here by the Commonwealth Government of Australia in 1938 to commemorate the first recorded landing of Europeans in Australia.